The above heading is the title of a book by German comrade Stefan Engel. It is a book that gives the reader a feeling of utter despair because of what capitalism has done to humanity and the planet, but also a feeling of hope as to what is possible when capitalism is forced off the world stage by the international working class and its allies for an alternative socialist society. # Threatening destruction of humans and nature by imperialist wars, by militarisation and rising arms production. Engel argues that the combination of these elements of the crisis calls the unity of humanity and nature into question in a general way. He is critical of all parties claiming to be leaders of the workers in western Europe for not only ignoring the growing environmental crisis but actually distorting Marxism by saying that labour is the only source of wealth. Compare this with what Marx said in The Critique of the Gotha Programme: "Labour is not the source of all wealth. Nature is just as much the source of use values as labour, which itself is only a manifestation of a force of labour, labour power". Engel argues that this distortion of Marxism put the parties pushing this line in the same camp as capital and reformist parties who were comfortable with confining struggle to economist limits. This manifested itself in working class "Marxist" parties ignoring the great work of F. Engels, Dialectics of Nature, in which he pointed out the danger of ignoring or underestimating environmental issues. Engels said in Dialectics Of Nature, "Let us not however flatter ourselves overmuch on account of our human victories over nature. For each such victory, nature takes its revenge on us. Each victory, it is true, in the first place brings about results we expected, but in the second and third places it has quite different unforeseen effects which only too often cancel the first." Stefan Engel gives numerous examples of this contradiction and how with the rapid development of capitalism and imperialism, the interchange between humans and nature underwent an essential change and caused major changes in the biosphere. Engel enumerates dangerous changes in the three elements of the biosphere: Lithosphere - layer of rock and soil we walk on, drive on, build on; Hydrosphere – water-covered part of the Earth; Atmosphere - mass of air enveloping the Earth. Engel argues that Marx realised that the development of capitalism disturbed the circulation of matter between humans and soil preventing the return to the soil of its elements consumed by humans in the form of food and clothing. Similarly, the impact of capitalist production impacted by thousands-fold the atmospheric climate. Engel describes climate "as the concrete mode of existence of the atmosphere in unity with the characteristics of the surface of the Earth in a certain region or zone. It developed over a long period of time in dialectical interaction with temperature, air pressure, atmospheric humidity, and the related circulation systems of air and water". He says, "there is no homogenous world climate, only regionally differentiated climate zones which influence each other, can transform in to each other and produce a constantly changing weather typical of the respective climate region". Engel argues that the Greens in all their various forms and shades of green can never solve the environmental crisis because they disregard the dialectical relationship between human labour and nature. They ignore the class struggle and that under capitalism human labour occurs in a relationship of exploitation by the capitalist class over the working class. The predominant aspect of human labour under capitalism is not use value but exchange value, the selling of labour power and the capitalists’ need to extract ever more surplus value. However equally, Stefan Engel argues that any alleged working class party that ignores or denies the twin sources of wealth, nature and labour and the unforeseen consequences of human victories over nature pointed out by Friedrich Engels, is doomed to failure and incapable of leading the working class to overthrow capitalism in its modern imperialist form. He completes his book with a very impressive program of the German Party of the working class, the MLPD, which shows the way to the liberation of the working class from exploitation by imperialism and at the same time shows the way to build an international resistance front to save the environment from the profit system He calls this "a programme of struggle against the environmental catastrophe". It contains an extensive number of demands to unite people. The demands include a radical stop to the clearing of forests, especially tropical rainforests and large-scale reforestation, complete elimination of fossil fuels and replacement by renewables, restriction on night and shift work, elimination of food speculation, expansion of public transport systems, ban on substances damaging the ozone layer, compulsory comprehensive recycling, ban on deep sea drilling, shutdown of all nuclear power plants, shorter working week with full wage time wage, protection of the world's oceans. This is a program of struggle for a socialist society in which the unity of humanity and nature is society's guiding principle. Engel’s highlighting of the unforeseen consequences of so-called "progress" extends to what happened in the Soviet Union and in China. He argues that both Lenin and Stalin strongly advocated protection of the environment, especially forests. Contrary to imperialist propaganda, Engel argues that Stalin, in particular, struggled to prevent deforestation but often did not get his own way as regional bureaucrats, convinced that Nature was there to be conquered and used without restraint by humans, often got the upper hand. Stalin's environmentalism ended when Khrushchev took over the leadership after Stalin's death. Engel also says that the rapid advance of industry in the Soviet Union was powered mainly by hydro electricity plants, not fossil fuels. In this sense, the Soviet Union was ahead of its time. Engel also refers to the documented policies of the Chinese Communist Party of the early 1970s about protection of the environment and contrasts this with post-Mao leadership and the reckless pollution of the environment under the guise of "development of the productive forces", ignoring what Engels had to say in Dialectics Of Nature. In summary, the book is an extremely important work as it convincingly argues that working class leadership of both the class struggle between capital and labour and for environmental sustainability is a pre-condition for the successful struggle for harmony between humanity and nature. 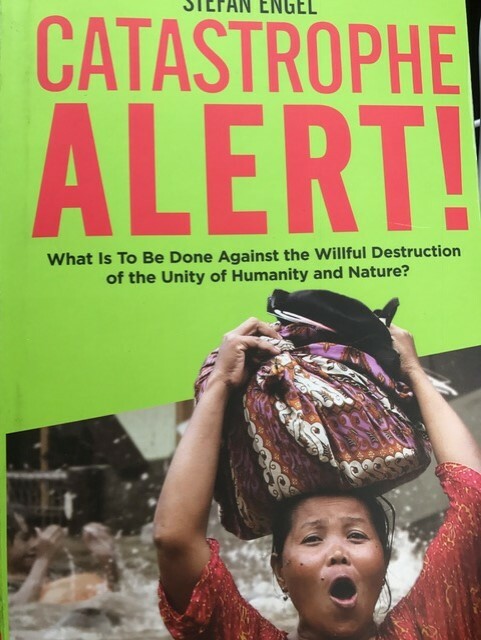 Title: Catastrophe Alert! What is to be done against the willful destruction of the unity of humanity and nature?